This article will guide you through the steps to relocate a PDB by moving it between two root containers with near zero-downtime. The process is similar to performing a remote clone of a PDB. Note: In this context, the word "local" refers to the destination or target CDB that will house the relocated PDB. The word "remote" refers to the PDB that is to be relocated. The remote CDB must use local undo mode. Without this you must open the remote PDB. The remote and local databases should be in archivelog mode. The local database must have a public database link to the remote CDB using a common user. The common user in the remote database that the database link connects to must have the CREATE PLUGGABLE DATABASE and SYSDBA or SYSOPER privilege. If the remote database uses Transparent Data Encryption (TDE) the local CDB must be configured appropriately before attempting the relocate. If not you will be left with a new PDB that will only open in restricted mode. I have two databases running on the same virtual machine as an example for this guide, but they could be running on separate physical or virtual servers. cdb1 : The local database that will eventually house the relocated PDB. cdb3 : The remote CDB that houses the PDB (pdb5) to be relocated. Connect to the remote CDB and prepare the remote PDB for relocating. 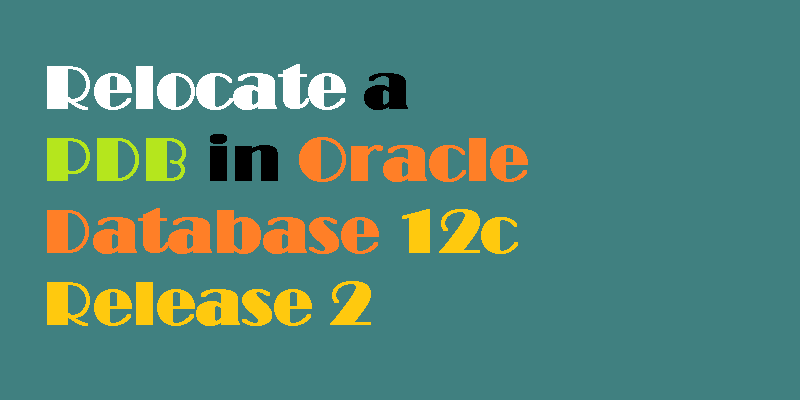 Create a user in the remote database for use with the database link. In this case, we must use a comon user in the remote CDB. Switch to the local server and create a "tnsnames.ora" entry pointing to the remote CDB for use in the USING clause of the database link. The connection details must include the "(SERVER = DEDICATED)" entry, or you will receive a "ORA-01031: insufficient privileges" error. Connect to the local database to initiate the relocate. Check the local CDB is in local undo mode and archivelog mode. Create a public database link in the local CDB, pointing to the remote CDB. Remember to remove this once the relocate is complete. It is a massive security problem to leave this in place! Create a new PDB in the local CDB by relocating the remote PDB. In this case we are using Oracle Managed Files (OMF), so we don't need to bother with FILE_NAME_CONVERTparameter for file name conversions. Drop the public database link. If we switch back to the remote instance we can see PDB5 has been dropped. Moving the database is only one aspect of keeping a system running. Once the database is in the new location, you need to make sure connections can still me made to it. The options are as follows. If your connection information is centralised in an LDAP server (OID, AD etc.) then the definition can be altered centrally. If both CBSs use the same listener, the relocated PDB will auto-register once the relocate is complete. If both CDBs use different listeners, the LOCAL_LISTENER and REMOTE_LISTENER parameters can be used to configure cross-registration.